Some of my clients have many websites that they track with Adobe Analytics. Normally, this is done by having a different Report Suite for each site and then a Global Report Suite that combines all data. In some of these cases, my clients are interested in seeing how often the same person, in the same visit, views more than one of their websites. In this post, I will share some ways to do this and also show an example of how you can see the converse – how often visitors view only one of the sites instead of multiple. Here we can see that (~42%) remained in the “Site1” site, but if they did navigate to others, it was the “Site2″or “Site3” sites. You can switch which site is your starting point at any time and also see reverse flows to see how visitors got to each site. You can also see which sites are most often Entries and Exits, all through the normal pathing reports. Now let’s imagine that upon seeing a report like the one above, you notice that there is a high exit rate for “Site1,” meaning that most visitors are only viewing “Site1” and not other sites owned by the company. 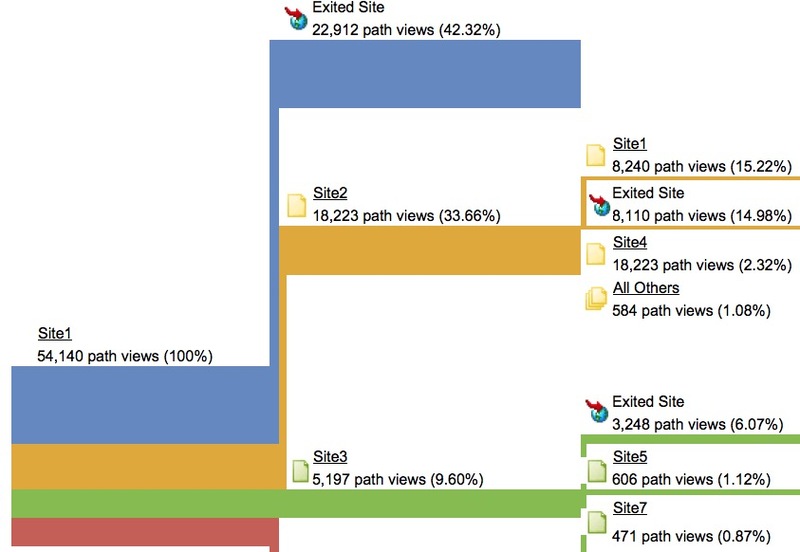 Based upon this, you decide to dig deeper and see which sites do better and worse when it comes to inter-site pathing. You can now do the same for each site and see which ones are “one and done” and which are leading people to other company-owned sites. For some clients, I add a bunch of these reportlets to a single dashboard to get a bird’s eye view of what is going on with all of the sites. You will have to build a different segment for each of your sites, but you can do that easily by using the Save As feature in the segment builder. 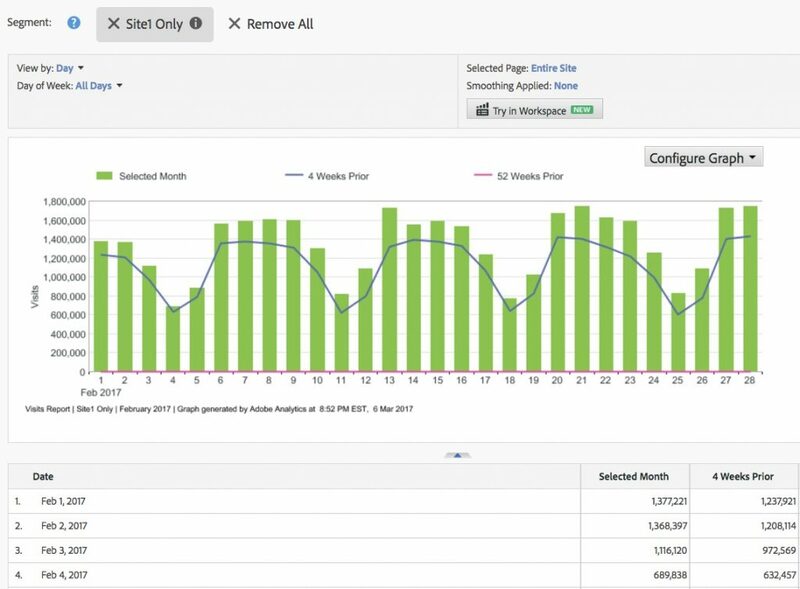 Lastly, since all of the cool kids are using Analysis Workspace these days, you can re-use the segments you created above in Analysis Workspace and apply them to the Visits metric and then graph the trends of as many sites as you want. Below I am trending two sites and using raw numbers, but could have just as easily trended the percentages if that is more relevant and added more sites if I wanted. 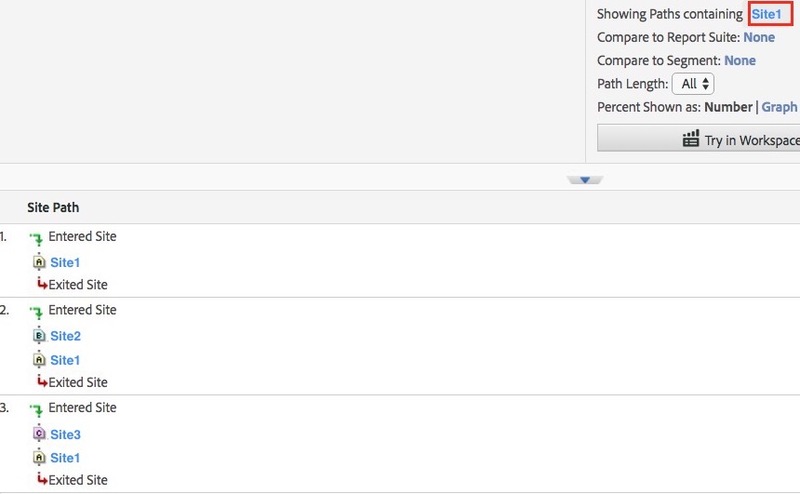 This allows you to visually compare the ups and downs of each sites’ single site usage in one nice view. 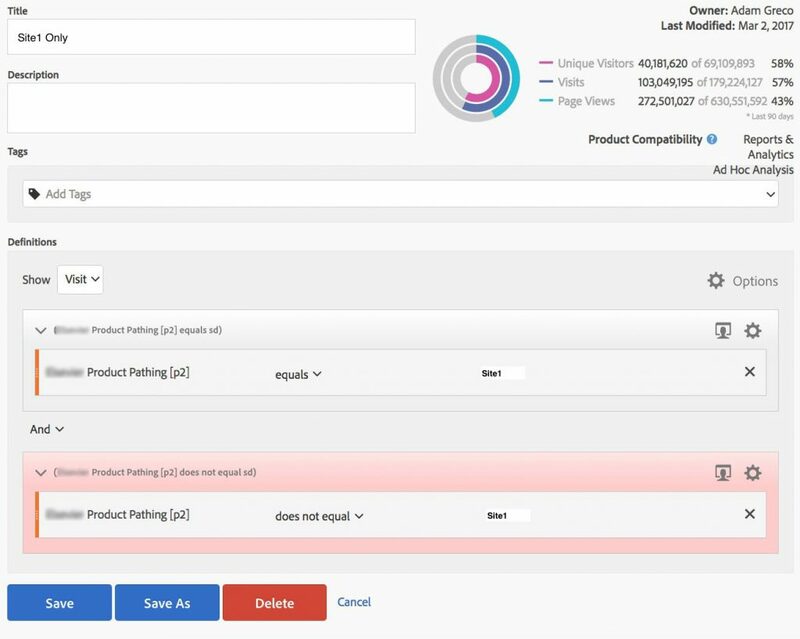 So to conclude, by using a site identifier, Pathing reports and Analysis Workspace, you can begin to understand how often visitors are navigating between your sites or using just one of them. The same concept can be applied to Site Sections within one site as well. To see that, you simply have to pass a Site Section value to the s.channel sProp and repeat the steps above. 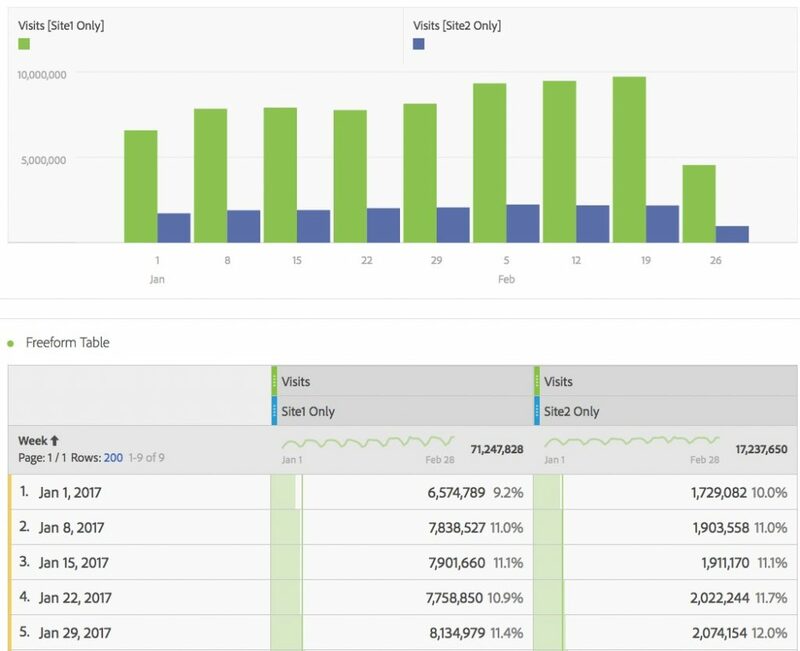 So if you have multiple sites that you expect visitors to view in the same session, consider trying these reports to conduct your analysis. I’ve got a 101 question on this… what if your sites are on different domains, and you’re serving FPC for each? We pass unique site identifiers to a variable on each hit, and double-report to a global suite, but won’t that global suite not recognize users when they visit a site on a different domain when we’re serving them an Adobe cookie from that different domain? If you’re using FPC and on Visitor ID w/ RDC, you can append the Visitor ID across to your other domains. Adam & his team can probably confirm the same or expand. I used this solution (appendVisitorIDsTo) to link my Native APP to my webView checkout and worked properly. Before this implementation, I had a scenario with 1 visitor/visit in the catalog and another visitor/visit at the checkout. Numbers weren’t correct. We had massive problems with the 3rd party cookie “demdex” that connects sessions between different domains. This cookie is used if your tracking bases on FPC and Visitor ID Service and is set by VIDS to get unique visitor information from one domain to another. The problem is that if the browser blocks 3rd party cookies the connection is lost anyways and a new session and unique visitor is created when crossing domains. And this happens almost every time when the visitor uses Safari or Firefox because they block 3rd party cookies by default (at least 30% of all Visitors on our sites in Germany use those browser types). The result was a huge amount of “Internals”. That´s the reason we still work with 3rd party cookies/ fallback based on User Agent and IP and eliminate manually the fid fallback in the scode on our sites when sessions need to be tracked cross domain… no alternative so far.